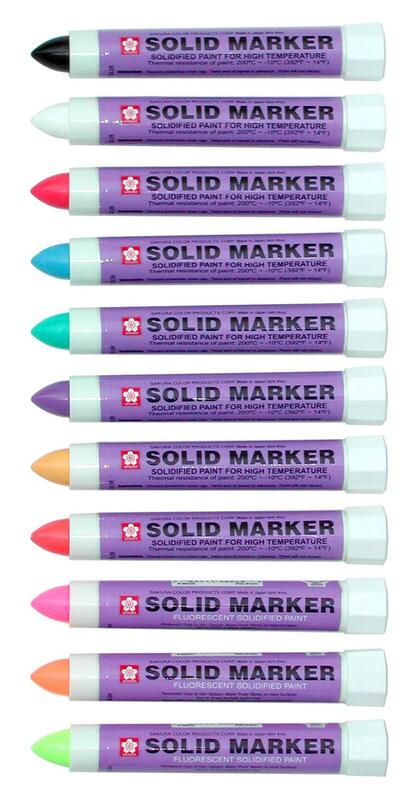 For big tough jobs, choose Sakura Solid Markers. 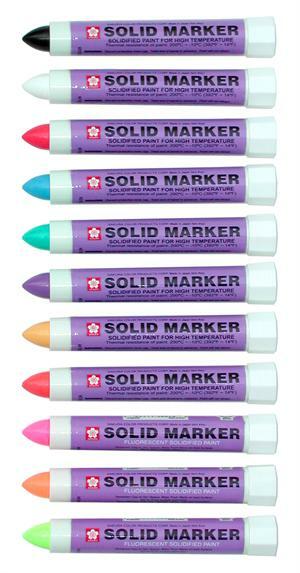 Sakura paint markers can mark through oil, grease, rust, mud, snow - inside or outside. They are absolutely permanent. Sakura markers won't fade or wash off like chalk. The special "stay fresh" twist top keeps paint fresh and ready to use. Used on construction sites to label anything exposed to the weather. Marks on sheet metal, auto parts, windows, steel, rubber, cloth, plastic, cardboard, wood, glass, concrete, stencil, craft projects, most anything. Colors available: Yellow, Orange, Red, Purple, Green, Blue, Black & White. Also available in Fluorescent colors: Pink, Orange and Yellow. Glow in the Dark is special order. PREVENT GRAFFITI! This product is intended for industrial and commercial purposes only. Defacing public or private property is illegal under state and local laws and possession of such products is similarly illegal for minors. Acceptance of this product acknowledges your responsibility in using, distributing and/or reselling this product for legal purposes only and restricts the sale to minors under eighteen years of age, where state and local laws apply.